As the years go by, I'm noticing that my lids are feeling the weight of gravity and drooping more than when I was in my 20s. Having Asian eyes which are semi hooded doesn't help either. Short of having surgery to correct the problem, what else can I do? In Asia, women have been using the hugely popular invisible tapes to create double eye lids or enhance the creases over the past few years. This idea has now caught on in western market and have gone on to additional uses, they can also be used to lift droopy eyes and create better defined creases. One such product in our market is Eye Define. The product comes in a box with a set of 34 strips of medical grade tape strips and a little tub of wax gel to help it apply to eyes. The lid tape itself are cut to a crescent shape to fit the eyes. 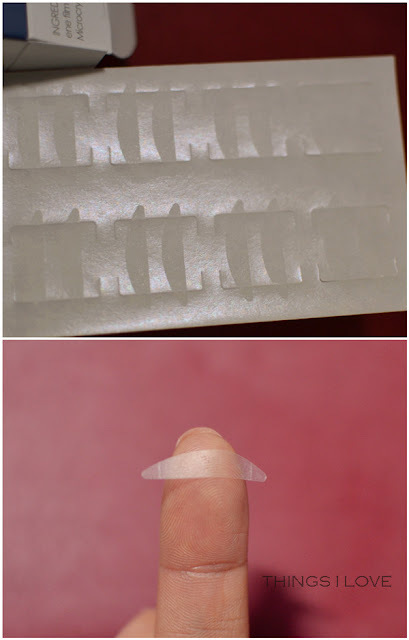 These are transparent temporary stick on lid tapes that you use to create deeper crease and hold the droopy lids in place. To use, simply use a pair of tweezers to lift the lid tape from its backing paper, wipe on a bit of wax gel to create a and then apply onto the lids of eye according to your eye shape. Don’t be afraid to use a pair of scissors to cut the tape to size to suit your eye shape if it is too thick, not curved enough etc. Play around with it until you find what works for you. 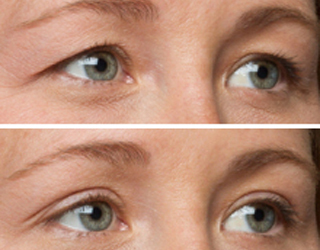 Instant results of lifted eyes and better defined creases, creating bigger eyes. Stays put and lasts all day long without irritating eyes and is very comfortable on eye lids. Cost effective and great for special occasion are perfect for those Kodak moments where you want to look fresh and at your best for the camera. Can be used over or under eye shadow. I find that the fading of eye shadows gives obvious lines around the tape so regular touch ups will be required when using shadow on top. Can be fiddly to work out the angle of which to apply the strips to create desired result. This means it can be time consuming unless you perfect your application of it. Depending on your eye shape and crease depth, they may not be as invisible as you like them to be. It will not be noticeable in photos but from speaking distance, people will be notice – just as they would with extravagant false lashes. 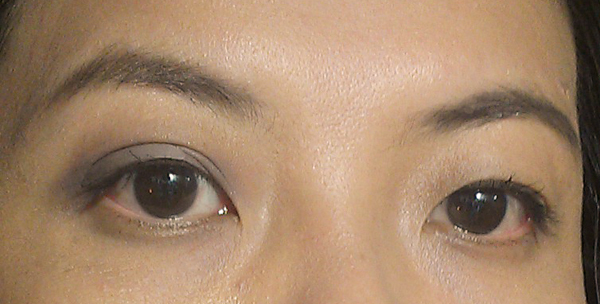 For me, the lift not only created a wider eye look, it also helped to remove the hooding of my eye lids so I have proper double eye lids, like what the Asian eye lid tapes could help me achieve. 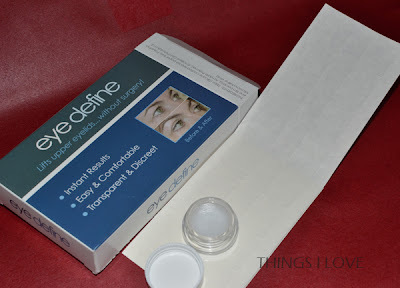 A pleasant surprise I had from using Eye Define was that after a couple hours of wear, and then after taking off the tape, my enhanced creases were maintained and I still had the benefits of enlarged double lids for a few extra hours longer. This meant I could have wider eyes without the tell-tale signs of the tape. Although I get gorgeous wider and lifted eyes using Eye Define, I'm not too excited about using it due to the the amount of time needed for me to get the angle right to create natural looking enhanced creases. If you have deeper creases, you will properly have fewer issues than me as you have more lid space to play with. In any case, practice makes perfect so if you are looking to use the product for a special event, make sure you do this a few times before you actually want to wear this out as you will need plenty of practice to know what angle you need to apply these eye lid tapes on. RRP A$29.95 from Eye Define online.